notice the address bar being "data:text/html,%3CH1%3EHi! !%3C/H1%3E"
notice the address bar being http://www.intothesymmetry.com/CVE-2015-5764/file0.php !!!! As for almost all the parts of this book I wanted to try what it was written and I started a bit to poke around. 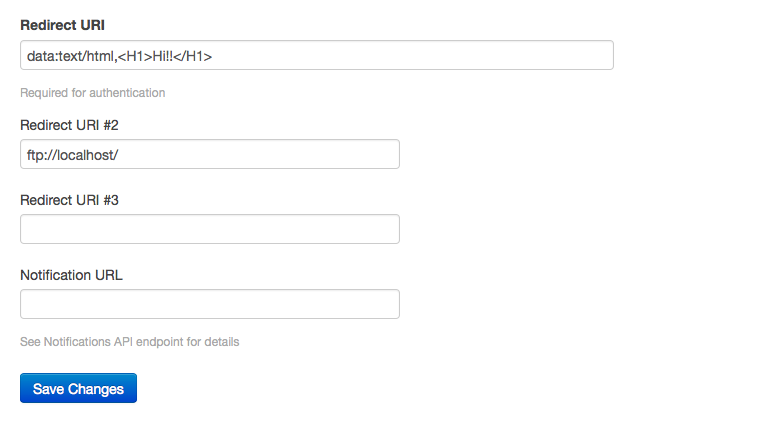 The followers of this blog know that I kind of like to "play" with OAuth. Hence I combined the two things and started to see what I could do. The first issue I found was the one mentioned in the Instant demo section above. Now when clicking at the link all the browser but Safari showed properly the address bar being data:text/html,%3CH1%3EHi!!%3C/H1%3E . Safari instead from the second visit onward would show the original website namely http://www.intothesymmetry.com/CVE-2015-5764/file0.php but with the HTML contained in the data:text/html pseudo-URI!!! At this point your question can easily be why on earth should exists a website that allow an attacker to manipulate a 302 redirect versus a data:text/html URI and how did you find this weird vulnerability :D ? The answer is: because of some OAuth 2.0 implementations!!! One of steps in order to obtain an OAuth client is to register a client application providing client name and a list of redirect_uri. 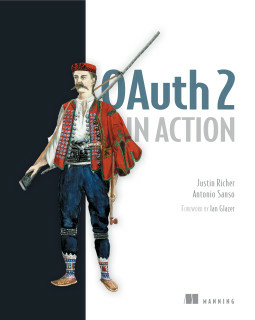 If you are not too much familiar with OAuth 2.0 here you can find a book on OAuth that Justin Richer and myself have been writing on the subject. 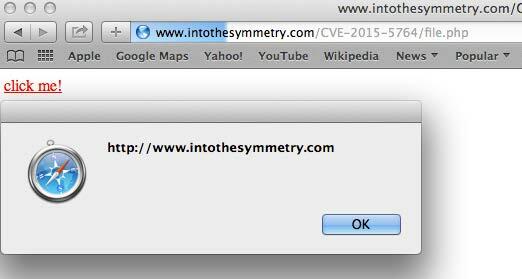 This means that also other user interface were vulnerable and not only the address bar. 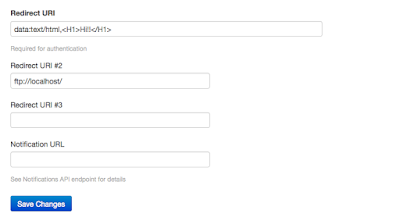 One of the vulnerable component was the title of the alert box (that is commonly used for anti-phishing) . But looks like Apple fixed this part of vulnerability in the previous security update. I'm on Mac OSX 10.10.5, Safari web browser 8.0.8 (10600.8.9). I'm writing that comment because in your blog post, under "Instant demo", it reads "In Safari up to 8.0.8 :...."